My gift to you on this, the day after Thanksgiving, the first Day of the Christmas season, a new free pattern! It’s that time of year when I start frantically making sure my family has warm things to cover their heads, hands, and feet, because the weather has decided it’s pretty much winter. 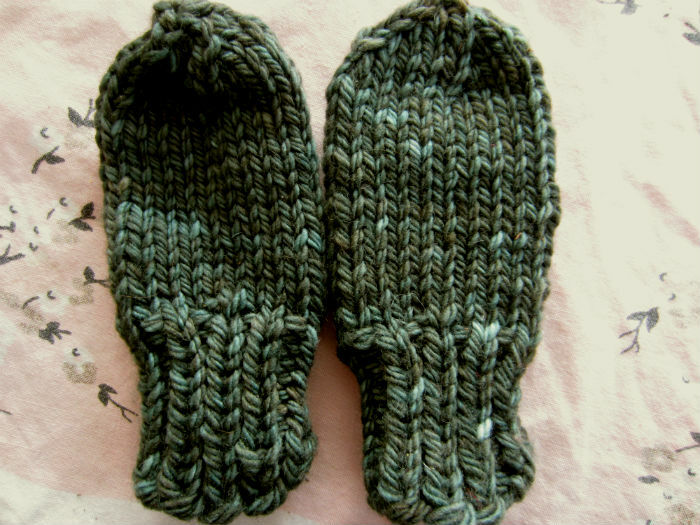 Since I have a wee little one this year, I got to make the simplest, quickest pair of mittens there is. Chunky mittens with no thumbs! Just a cuff, and a hand! And on size 10 needles, these little suckers are done in no time. If you have a baby in your circle, these are a super quick, fun little gifts to help keep teeny tiny fingers warm this winter. With lego rocker chic for scale. Is the axe part of her show? Who knows? In the pattern, I say to use DPNs, but please use whichever method you are fond of. 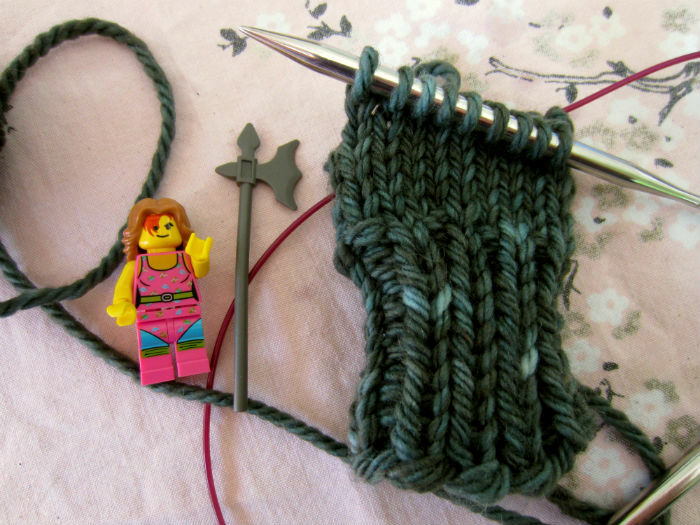 Obviously, you can see I knit my mittens using magic loop, which has been my default lately, mostly because finding one circular needles is usually easier than four DPNs in the same size. At the beginning of the next round, switch to ST stitch, adding two sts in the first round for a total of 20 sts. Knit every round for 3 inches. Pull yarn through sts, and weave in securely. At end you have “Pull yarn through sts, and weave in securely” New line “Weave in all ends,” New line “Knit Two” New line “Block” What is the “Knit Two” about? Enjoyed, “Lego Rocker Chic for scale” Is Lego Rocker 1″ or 1 1/2″. I was just playing with God children, Addison 7 and Alaina 3 1/2, with their Lego’s. We had a lot a fun. Addison made a Zip line with yarn and her imagination or know how. It worked. 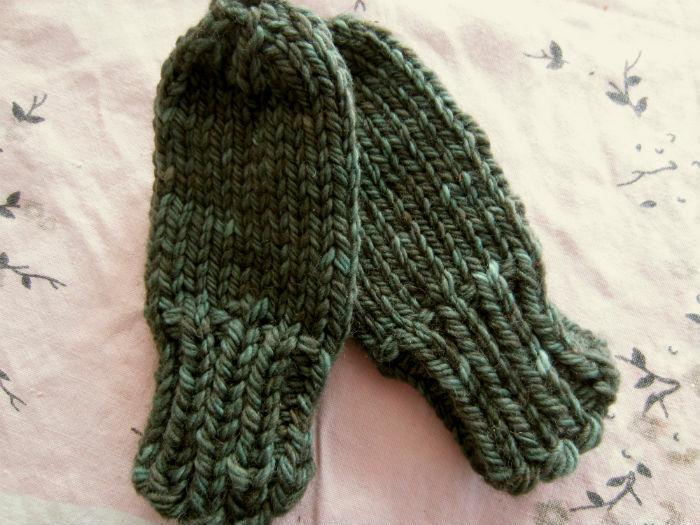 I say “knit two” so that you have two mittens, one for each hand. I think it’s 1 1/2″, but that’s just a guess.